75 hp motor soft starter, 55 kW three phase 240v, 440v, 480v, 660v for selection. Model GS2-055 (240v), GS3-055 (440v), GS4-055 (480v), GS6-055 (660v). Tips: Can a soft starter control the induction motor in variable speed? A soft starter can NOT control induction motor speed, it only restricts motor starting current by applying the voltage in a ramp to avoid inrush current impact on the motor. 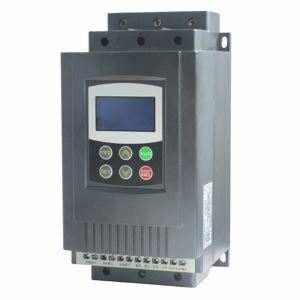 To vary the speed, you should go for a variable frequency drive which can control the induction motor speed along with starting torque, but cost much more than a soft starter. The selection between VFD and soft starter depends on lots of factors, you can check our blog post regarding VFD vs Soft Starter for details.